Rock star restaurant duo Chef Wesley Randles and Simon Widdison open The Commissary | Eat. Play. Drink. Cape Town. 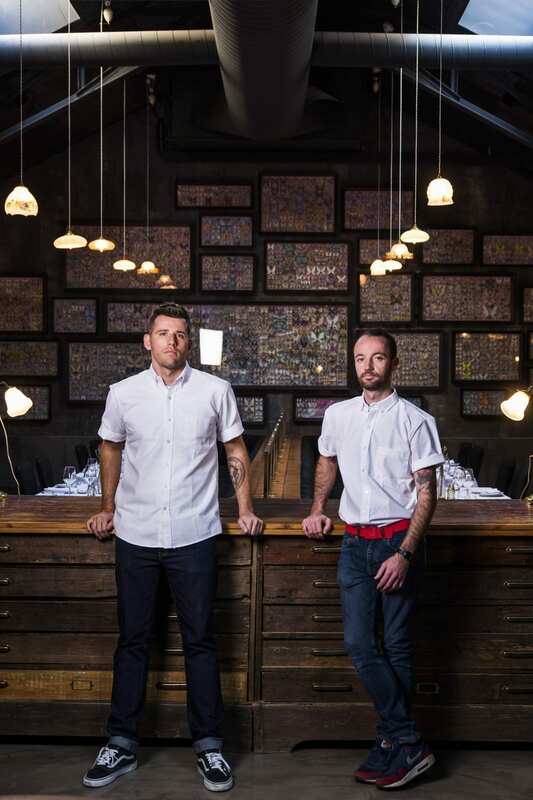 AN exciting approach to pared-down, no-nonsense, dinner-only dining, care of rock star restaurant duo Chef Wesley Randles and Simon Widdison, and under the mentorship of Luke Dale Roberts, looks set to shift Cape Town’s cuisine scene. As if The Test Kitchen, The Pot Luck Club and The Shortmarket Club aren’t enough to keep Dale Roberts and his crews on their toes, the opening of another cutting edge eatery is sure to set both local and international food wires alight. The Commissary opens its doors on November 1 and is a food market-esque concept The Shortmarket Club chef and co-founders Wesley Randles and Simon Widdison and their team will head up six evenings a week. “A commissary is a basic provisions store which you’ll find in the army, hospitals and prisons – and while we definitely won’t be serving prison fare, we’re taking things back to basics in a big way with our new dining venture,” says Wesley. The concept is an exciting one and there is no doubt it will get foodies talking. “I’ve had the idea in my head for a while – a space where people can come and enjoy seriously approachable, affordable food with big, unapologetic flavours,” says Wesley, who together with front-of-house talent Simon Widdison has made a name for The Shortmarket Club in just two years of operation. The Commissary will be under the same roof as its sibling inner-city eatery but will be reached by an otherwise nondescript street level entrance. “I wanted to create something that really epitomises getting back to basics – it’s a no reservations restaurant, there’ll be communal tables in an open plan space, there’ll be music playing and a busy atmosphere. We’ll be serving food on eco-friendly, disposable plates and the most basic cutlery – it’s a cool, no frills atmosphere with small plate, flavourful food taking centre stage,” he says. The news of The Commissary follows the announcement that another new concept fine dining destination in the Dale Roberts restaurant empire opens this October. Salsify, at historical landmark The Roundhouse in Camps Bay, will open with chef Ryan Cole at the helm and promises to be a boundary-pushing, sensory fine dining experience. As with Salsify, The Commissary venture is a partnership with multi award winning chef Luke Dale Roberts acting as mentor and advisory partner and with Wesley, Simon and their team operating the rest of the business. “Over the years I’ve realised that one of the things that really motivates me is helping team members reach their potential and find their own way. Getting to play a part in that journey is so exciting,” says Luke. “Wesley came to me with the idea a while ago and I loved it – it’s a back-to-basics approach to food which really resonates with me and everything I love about food and I couldn’t think of anyone more driven and committed than Wesley to make it work,” says Luke of his 29-year-old mentee. Wesley has risen through the ranks as one of the strongest members of Luke’s team – first at La Colombe just over a decade ago, then moving to open The Test Kitchen alongside Luke, followed by opening The Pot Luck Club and most recently co-founding The Shortmarket Club, which opened in July 2016. With space for just 45 diners at a time and a busy, convivial atmosphere, The Commissary will hit a gap in the ever changing Cape Town restaurant market; it’s a fast-paced eatery perfect for 21st century diners with things to do and places to be. Likewise the design of the space by the business’s design director Sandalene Dale Roberts taps into the busy atmosphere of the soon-to-be-open space. “I wanted to really ramp up the space with colour. It’s the kind of concept that allows for it. Food markets have taken the world by storm and we also wanted to reflect that style of dining and entertainment. Likewise, the wine list at The Commissary will be small and carefully crafted: “We’ll be serving around 10 wines by the glass, from entry level offerings to serious heavy hitters, most important to us is that they cope well with a wide variety of food and flavours,” says Wesley. With just a few short weeks to go before The Commissary opens, Wesley, Simon and their team are hard at work keeping The Shortmarket Club clientele happy by day and making plans for The Commissary at night. For local foodies, the concept is a thrilling one and there’s no doubt that getting a spot in this cutting edge new dining destination is going to be a hot seat indeed.